If you have ever been to a Luxembourg Kiermes, you will have come across, and hopefully tasted, Gromperekichelcher: Deep-fried potato cakes that are served with apple compote. My absolute favourite! What if there was a way to make them even better? Say by stuffing melted cheese and smoky ham between two (!) Gromperekichelcher? Total indulgence – yes please! Plus, it’s super quick and easy to make and hence the perfect hangover food for a lazy Sunday morning. 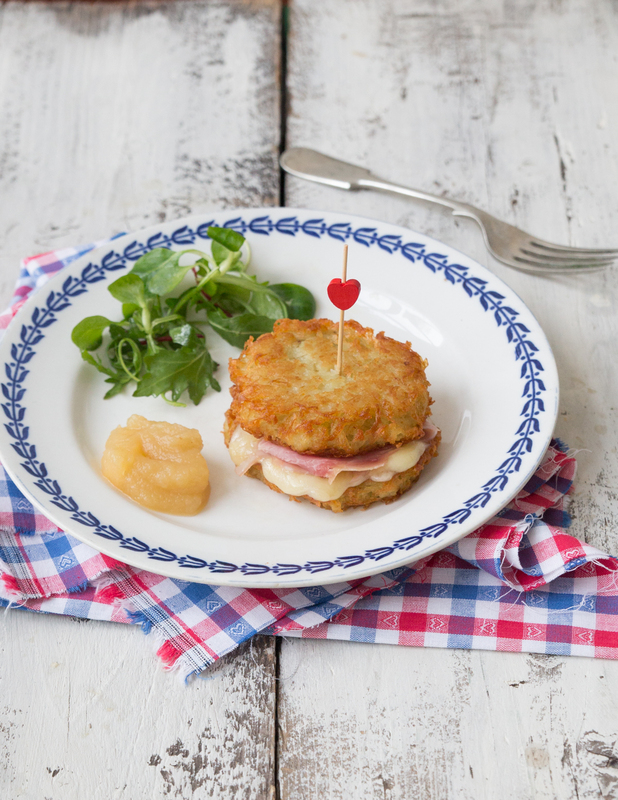 I like to use Luxembourg ‘jambon paysan’ in this recipe, as its taste is the perfect match for this hearty dish. You can watch me make a Gromperekichelchen Cordon Bleu in my show. Peel the potatoes and finely grate them. Season with salt and put into a sieve over a bowl and press out as much liquid as you can. Pour enough groundnut oil into a frying pan for the entire bottom of the pan to be covered. Heat the oil and test if the oil is hot enough by dropping a tiny bit of batter in – if it starts bubbling, you’re good to go. Drop 2 tablespoons of the potato mix into the pan to make 2 Gromperekichelcher, flatten and fry on each side for about 2 to 3 minutes. Take out of the pan and transfer to a plate lined with kitchen paper, to absorb some of the grease. Continue with the remaining batter and make 2 more potato cakes. Fry on one side for 2 minutes, flip over and top the fried sides with ¼ of the grated cheese, half a slice of ham and the remaining cheese, then top with one of the Gromperekichelchen that you fried earlier. Keep frying for 2 minutes, sot the cheese melts and the bottom Gromperekichelchen becomes crispy. Serve straight out of the pan with a dollop of apple compote and a green salad.